Join Mal, Wash, Zoë, Inara, Kaylee, Jayne, Simon, River, and Book as Fluxx enters the 'Verse at full speed. With the rules constantly changing, Firefly™ Fluxx is just as unpredictable as misbehaving in space! Featuring sumptuous art by Adam Levermore, Firefly™ Fluxx is perfect for fans and collectors of both Firefly™ and Fluxx. 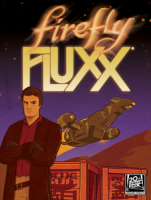 Add a Review for "Firefly Fluxx"